Tristan from Kennyist Studios has created a fantastic Alan Wake Rainmeter theme which is free to download and use! The theme is designed to mirror the in-game interface complete with the health bar (battery life), destination/goal (notes), and torch symbol (free hard drive space). 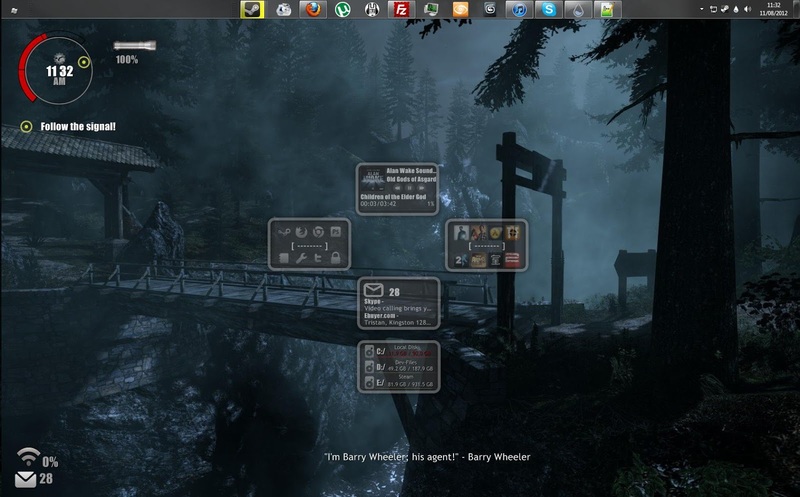 There's a variety of elements to add so you can customise your desktop, including an Alan Wake news tracker! It's a very clever design! Check out the project at the Remedy forums or Kennyist Studio. We have presented you best rainmeter skins so that you can completely change your desktop and visual appearance of your Windows. It is essential to change it once in a while so that you can feel like a person while using it.